It's a good thing that there are so many people who have never said any thing they later regret, sent an email or letter they later regret or made a career choice they later regret. This way when they point out the faults in someone else it doesn't come across as judgmental in the slightest, even if that person is very young and is someone who has possibly seen their dreams (like being the starting QB on an Urban Meyer led OSU squad) take a huge hit. It also doesn't seem petty at all that they would choose to make light of the name given to them by their parents. He probably should have just done the mature thing and went to his parents and told them he was going to change his name to be more acceptable to everyone and then everyone would think he was cool. That's probably what he should have done, yeah. I assume you have something other than conjecture to make an accusation that the head coach "didn't care". I mean otherwise I could say that some people don't seem to care about using facts to substantiate their opinions when they comment. That would be wrong of me to do so. Well, the Iowa game happened when J. T Barrett was the QB. I'm not sure pointing fingers at the current QB is the thing to do right now. Echoing the thoughts of some of the other posts: Survive and Advance. At this point in the season, there are teams with a ton of youth starting to figure things out and put a hurting on the favorites. I think the thing that gets lost quite a bit is that Saturday was the championship weekend for Minnesota. 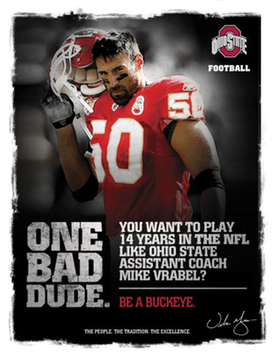 The Buckeyes gets everyone's best shot every week. Every. single. Week. Look at Georgia losing to LSU. That is a tough place to play on the road but it's losses like that one that make the PSU win look even better. PSU waited all year to avenge last years loss and had the "white out" and we had a freshman QB playing in an atmosphere like that for the first time. Survive and advance. All of these close games will help at the end of the season because they have been there before and hopefully won't be scared of the moment. Will they be underdogs if they make the playoffs? Yep. I love rooting for an underdog and Coach Meyer does a great job coaching up the underdog. I wish I had more upvotes to give to this comment. I have had to examine my attachments to things like OSU sports and finally realized how silly it all is. The sports aren't important here. The lives of the people involved are the important issues here. There are children that are going to be dragged into this in court. Family and friends torn apart. Just a sad, sad situation. Geaux Jeaux indeed. Great skully. Best of luck in your new endeavor. Mt question is what is best for him? It was obvious that he has a difficult time creating his own shot, even against middle of the road defensive players. If he comes back to college, will he get the best opportunity to improve his game playing against kids who will mostly be younger than he is and with much less experience or will it be better for him to get paid a salary while testing his abilities against players of the same experience lever and higher so he can improve. I watch a ton of NBA and right now he would not get the same types of opportunities for shots as he isn't aggressive or athletic as the other players will be. I would hope he sees the need to play and train against the highest possible level of competition and get paid while doing it. Taylor is wrestling at an unbelievably high level right now. He won the Yarygin right alongside Snyder. Taylor has world champ written all over him. I want him to pin Yazdani again. When Nickal tossed his head gear like that I have to believe Cael Sanderson didn't like that. He really had no class right there. That's disturbing on many levels. Maybe you might want to get some fresh air, sir. B10 POY with 25 points against constant double teams the entire game, but yeah...he choked. Wow this fan base sometimes. What is it about playing against us that makes every crazy shot Tony Carr takes go in? Two of his shots from 3 were absolute prayers. Unreal how lucky they were against us this year. I am interested in your statistical and medical information that supports your statements. There have been multiple studies that show how head trauma causes the problems the players are experiencing. They have done autopsies on the diseased brains of the men who suffered from CTE. In fact: "The link between football and traumatic brain injury continues to strengthen. Now, one of the largest studies on the subject to date finds that 110 out of 111 deceased NFL players had chronic traumatic encephalopathy (CTE), a degenerative brain disorder associated with repetitive head trauma.Jul 25, 2017"
The nature of the game, where we ask or demand players to throw their bodies into collisions we know for certain cause lasting and irreparable damage, is now not debatable. How much more data is required to finally prevent us from putting children and young people into a meat grinder like this? To the person who stated Snyder didn't back up his talk: The man Is World and Olympic freestyle champion and the guys he wrestles at this weight class regularly out weigh him by 20-30 lbs. He just won a gold medal for the second time (first american male to ever do it) in the most prestigous wrestling tournament in europe. What does he have to do to satisfy you? While I understand your intention, isn't there a better way to illustrate your point? I was not part of the DV mafia but I understand being disgusted by swastikas AND the hammer and sickle. Wow. And I thought Christmas only came once a year. Katee Owen, a national treasure. I really don't understand all of the "Time to schedule cupcakes instead of OU" takes. Why would you want the team to just slide in based on beating teams with inferior rosters and facilities? I will defend any decision to schedule the best teams possible for every game. Imagine trying to sell a potential recruit on our great record against the Bobcats of OU or the nationally televised games with slippery Rock State? We are like the Yankees of CFB and we need to have a high standard. We don't need to lower our standards because of the standards of another university. To be the best you have to beat the best. We didn't this year. Why people are DV you when you said just disagreed with someone +1 to offset the snowflakes. Man, I will be glad when JTB is no longer the local punching bags for the "Elite Couch Coaches of Ohio". When the entire team doesn't play well, they won't have one the most humble and team first players this university has ever had, to blame and will have to move on to the next squirrel. Great season. No reason to complain about the decision as the team held their destiny in their own hands if they had taken care of business. They had a disappointing showing in Iowa and it cost them. This also does not define the season as they are BIG champs and continue to dominate that team. Congratulations on an awesome win last night and good luck in the bowl game.